Please note that heavier products and multiple cartons may require additional shipping charges. For example: Swim Fins and Bags. A Finals Customer Service Representative will contact you to confirm the charges. Shipments - 2nd day or Priority Mail only. For Priority Mail cost, see Ground service. Please add additional $8.00 to 2nd Day Air charges. 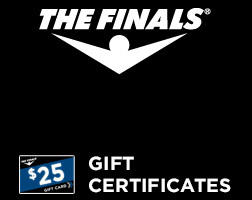 TheFinals.com has partnered with a trusted third-party company, GlobalShopex.com to fulfill orders for our international customers. Simply add any items you wish to purchase in your shopping cart and choose the “International Checkout” option. The items will automatically transfer to the GlobalShopex cart. For more information please visit globalshopex.com. 1. Complete the Return Form attached to the packing slip that you received with your merchandise or Click Here to download and print the Return Form. 2. Place the Return Form in the box with your merchandise. Please send your package including the Return form via a prepaid, traceable and insured method to help ensure a safe documented delivery. Make certain that your name, address and phone number are included. Return mailing expense is not refundable. We will process your return and follow your instructions. Please allow 7-14 business days for your exchange or credit to be processed. Please allow 1-2 billing cycles for the credit to appear on your statement. Shipping and handling fees are not refundable.